CHESHIRE, Conn. (November 10, 2018) – Today Cheshire’s Lights of Hope celebrates “Light the Night with Hope,” as more than 50,000 luminaries illuminate streets throughout the town. This year’s event raised $75,000, the highest amount in five years, thanks to an increase in contributions, additional volunteers and sponsors, and for the first time selling out luminary kits. The annual luminary event has now raised more than $915,000. During the afternoon ceremony on the Cheshire Town Green attended by more than 100 volunteers and sponsors, Don Walsh and Jenifer Walsh, co-founders of the organization, proudly announced due to the success of this year’s donations and sales of luminary kits, the nonprofit is able to increase its grants, awarding $14,000 to the Cheshire Community Food Pantry, $14,000 to Cheshire Youth and Family Services, and $8,500 to the Petit Family Foundation. The money raised will also award two $2,000 scholarships for volunteer-oriented high school seniors in June 2019. The event also funds Cheshire’s Lights of Hope commitment of $25,000 toward the construction of the new Cheshire Community Food Pantry building. The third of four installments will be presented early next year to the Community Food Pantry and Cheshire’s Lights of Hope will continue to make donations throughout the year to other Cheshire-based organizations. Founded in 2005 by Don and Jenifer Walsh with a small group of neighbors, “Light the Night with Hope” expanded to a town-wide event in 2007. Through acts of kindness and generosity, the organization encourages good citizenship and promotes volunteerism while embracing and supporting local charities. Cheshire’s Lights of Hope raises funds through sales of luminary kits. 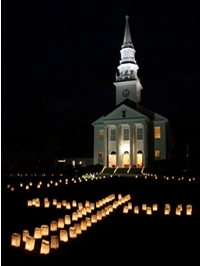 The luminaries are simultaneously lit throughout the town by schools, churches, local businesses and by residents. The proceeds raised are then donated in the spirit of “Neighbors Helping Neighbors,” which is the mission of the organization. “Cheshire’s Lights of Hope would again like to thank all of the residents and businesses who purchased luminaries or helped organize the event. Thank you to all of the friends and sponsors of Cheshire’s Lights of Hope who donated funds, time, talent, goods and services to light up Cheshire, and particularly, the Mile of Hope on Route 10. We’d like to say a special thank-you to: Joe and Robin Whitright and the entire staff at Paws Pet Resort & Spa, the Cheshire First Congregational Church, Pat and Terry Bowman and the entire staff at R.W. Hine ACE Hardware, Main Street Caffe, Cheshire Nursery, the faculty and students of Cheshire Academy and Coach Drust and the CHS football team along with Coach Kristine Drust and the CHS softball team” said Don Walsh. Next year’s luminary event has been scheduled and will be held on Saturday, November 9, 2019. Cheshire's Lights of Hope also intends to bring back its Summer Picnic event at a date to be announced. Luminaries and Cheshire’s Lights of Hope merchandise can also be purchased year-round for the holidays or other events on cheshireslightsofhope.com.